I like to write long articles on different subjects, trying to pack them with information and to go really deep into the issues. However I do realize that not everyone wants to read those long articles. Instead many people just want to get the key takeaways from each article and how they can apply them to their own lives. 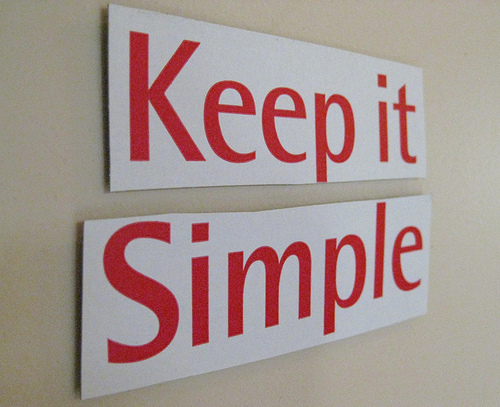 So that’s why I am introducing a new series: Keep It Simple. Here I will try to post short summaries of what I have written up to that point and what is important to get out of that. The world of fitness is full of misconceptions and contradictions. It can get pretty confusing for a newbie, but even for more advanced lifters. There is so much contradicting information out there, that a person has a hard time making sense of it and applying it to their own routine. That’s why it is very important to look at all the advice that is given and try to determine how it applies to you. Each one of us is different and that’s why what works for one person might not always work for another person. However fitness advice is often given out as the “truth”. However if you look at some of the supposed truths more deeply, you can see that they are more akin to opinion than some scientific fact. Key Lesson: Do not blindly follow any routine you find, but instead try to determine whether it will bring you closer to the goals you want to accomplish and fits your body and mindset. Compound exercises are a key to any bulking routine. If you want to gain weight and muscle, then your routine needs to be based around these types of exercises. Isolation exercises are not as efficient at recruiting all the different muscles that you have and stimulating your entire body to grow. Instead compound exercises recruit several muscles at once and are a more efficient way of growing your body. Some examples of compound exercises are squats and good mornings. Key Lesson: In order to grow, you need to focus on exercises that recruit several muscles at once: compound exercises. However you need to pay a close attention to form, as improper form can lead to injuries. The differences in viewpoints can be illustrated by looking at the concept of muscle confusion. This concept rubs a lot of fitness gurus the wrong way. They state that there is no such thing as muscle confusion and the only thing that matters is muscle overload, that is constantly lifting heavier weights. However on the other hand, there are some fitness gurus that have made muscle confusion the key part in their routines. There is nothing that proves or disproves this concept and so the discussions on whether it works are just shouting matches. Some people say that it works for them, while others state that they don’t want anything to do with the concept. Key Lesson: Muscle confusion can work you, however it should be applied in the right context. A lot of people just go around the gym doing some random exercises without having any plan. So at the end they see very little progress. If you want to make progress with a routine based on muscle confusion, you need to be systematic about it. Muscle confusion also works better in certain contexts and goals. For example if you want to lose weight, then a routine based on muscle confusion is a good way to go. However for gaining weight, I would stick to a strict routine based around heavy compound exercises and progressive overload (lifting heavier and heavier weights). Another controversial topic is the tempo or speed of a rep when lifting. Some people argue that you should lift slow, while others argue that you should do it fast. There are various arguments pro and con for each. However it seems that most people that argue for lifting fast have strength as their goal, while many of those arguing for lifting slow have size as their goal. However there is no consensus on what type of effects the speed of a rep has on your body. Key Lesson: The speed of lifting is not a very important parameter. Try to experiment with different speeds and see what fits you best. For beginner lifters I would advise to start lifting slow, to learn proper form and keep the weights under control. There are different types of hypertrophy and the one you are going for will determine the type of a routine and how many reps per set you should do. The two main types of hypertrophy are: sarcoplasmic and myofibrilar. Sarcoplasmic hypertrophy is more about the increase in size of the muscles, while myofibrilar hypertrophy is more about the increase in strength. Key Lesson: If you want to go for strength you should do sets with reps in the 1-5 range, while if you want to go for size, you should do reps in the 6-12 range.